During search & detection training, dogs use their natural abilities to learn to locate and notify you that an item or person has been found when they go out in the field in Mooresville. Dogs naturally use their noses to find things in their everyday environment. This helps them to identify threats, determine other animals that may have been in the area, and tell them when there is food and water available. During search & detection training, dogs use their natural abilities to learn to locate and notify you that an item or person has been found when they go out in the field. If you have a dog who may be well suited for search & detection training, our professional team at Dogs By Andy K-9 Services is available to assist you. 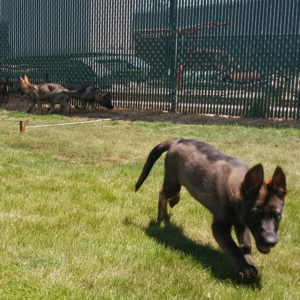 Each dog who enters search & detection training will respond differently to stimuli, have different skillsets that need attention, and will require a handler and trainer who can work to achieve their goals in Mooresville, North Carolina. At Dogs By Andy K-9 Services, we have over 15 years of experience training dogs at our state-of-the-art facility. If you are interested in having your dog go through search & detection training, we will determine if your canine’s age, breed and personality are well-suited. By learning which skillsets your dog already possesses and working on improved use of their natural instincts, your dog will be able to successfully complete this course. Search & detection training requires dedication and persistence, so your dog gains confidence in their abilities. It is also important to have a dog trainer who can recognize your pet’s strengths and weaknesses and provide feedback and achievable goals during their training. If you believe your dog would be great for search & detection training, contact us at Dogs By Andy K-9 Services today for more information. We look forward to working with you and your dog. We offer nose work programs that encourage your dog’s sense of smell in Mooresville. At Dogs By Andy K-9 Services, we provide search & detection training for dogs in the Mooresville, Concord, Gastonia, Huntersville, Charlotte, and Greensboro, North Carolina area, including Myers Park, Weddington, Ballantyne, and SouthPark.